Lawyers Economists Politicians Businessmen Decide Sunset Times? Ludicrous as it sounds, nowadays what time is it really depends more on lawyers, economists, politicians and businessmen and much less on the astronomers, geographers, surveyors, mathematicians and scientists as in the 19th century and before. 1.3M Earth matches the Sun’s volume, the Sun is 330,000 times heavier than the Earth, the Sun’s diameter is 1,390,000 km or 109 Earths side by side equates the Sun’s diameter. Sky Broke Like An Egg into Full Sunset? The sky broke like an egg into full sunset and the water caught fire – Pamela Hansford Johnson. Such was the sunset view we had onboard Luxury Tall Ship Royal Albatross. Singapore offers sunset watching spots from atop high sky scrapers to nature reserves where one can chant OM, meditate and be one with nature. You can use the sunset and the silence of the absolute to heal oneself in these sunset spots. For the expats who love some sunset watching in Singapore, whizz past city streets or through rainforest backdrops on your bicycle. For the casual cyclist, on the boardwalk by the scenic coastline, or why not stop, see, shoot a picture of the historic war relics on your evening day activity. 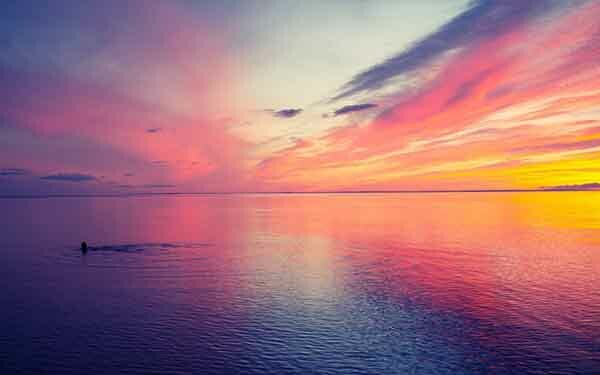 Changing Palette of the skies; Why sunsets are so beautiful? Sweet light of Sunset? Orange, reds, pinks gradually fade to purples and blues, changing palette of the skies. Why are some sunsets more orange and some sunsets more red? What about grey sunsets? Contact info@sunset.sg to place your ad here. SE Asia Sunsets Replicate in Singapore? There are many places to experience a sunset in Singapore, as there are many suggestions. Get your daily dose of relaxation, without the need to travel to other countries for example Halong bay, Vietnam; Kep, Cambodia; Penang Hill, Malaysia; Krabi,Thailand; or even Kota Kinabalu, Borneo for that streak of orange, red or blue in the sky, when you can get the very same sunset views right here. Falling in love is easy at sunset. At the end of a day, when the sun dips toward the horizon and you see a palette of colors across the sky – including your companion’s adoring face, it’s hard not to fall in love. Sunset as setting add (many) romantic places with dinner (hyperlink romanticdinner.sg) and cupid’s arrow aims straight at her (his) heart. With its unostentatious charm, it doesn’t have any skyscraper condominium nor boasts any megamalls, but neither does it fall into the dingy end. Never thought sunset views from atop a HDB can be so beautiful? Some towns even have history to their names. Ang Mo Kio “red hairy man”, Toa Payoh ” Big Swamp”, Queenstown, named after Queen Elizabeth II. You would expect a serene view to set the mood for the evening, as the night creeps in and stars dot the sky. Never would you expect a sunset watch to meet with such unusual experience. Off the coast of Pulau Ubin, be greeted by a 'basket star', not the stars you see in the sky. Many activities at sunset from watching incoming planes flying skimmingly low above the trees to heart in (your) throat 42 storeys up in the Singapore Flyer or navigating through flat terrain at Sunset railway.